The idea for this book evolved from a series of courses given at Maastricht University preparing for the EQE. For most Exam papers it is required to learn the necessary legal background and the substantive issues related to the subject of the paper. However, it also has to be learned how to answer the paper, i.e., how to formulate the answer in order to score marks. In particular, this applies to the opposition exam: the manner in which the paper has to be answered deviates in certain aspects from the daily practice of a European patent attorney. Many methods that have been thus far proposed for tackling the C paper are rather complex and time consuming, for example because large, even up to A3-size, tables have to be filled out with pieces of information from the exam paper. In addition, the experience of the candidates every year is that the C exam paper is 'too long'. Having sufficient time for writing the attacks requires an efficient and accurate analysis of the facts in the paper. For the courses preparing for EQE paper C in Maastricht, an entirely new methodology was developed which is simple, elegant and efficient. Only one simple table is employed and the analysis is set up in such a way that no information that is relevant for answering the exam paper is lost along the way. ​In the 2015, 2016, 2017 and 2018 EQE, all the participants in the Maastricht C course - even the re-sitters who before used a different methodology - enthusiastically used this new methodology and noticed, while sitting the exam, that they had much more time for writing their answer. 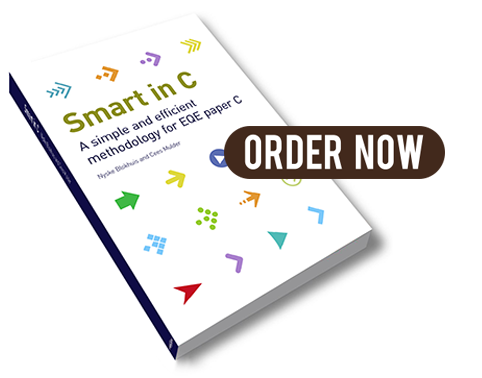 ​The book discusses the main themes of the C paper and describes in detail how the method works and how it is applied. As an Annex, a comprehensive analysis and detailed model solution of the 2015 EQE C paper is included. The methodology has been successfully applied by many candidates preparing for the EQE. In addition, the authors believe that the "Maastricht method" can be a helpful tool for experienced patent attorneys who are involved in opposition proceedings. In the third edition (issued in November 2017; updated in November 2018) the effects of decision G 1/15 have been discussed.